Belgian-born poet, Colette Inez died in January 2018. Here at VCCA, we mourn the loss of a good friend. 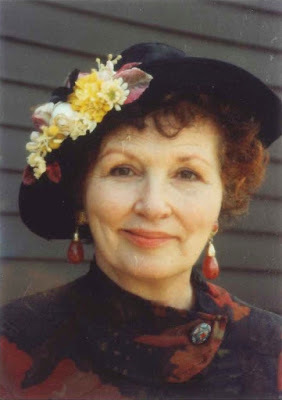 This award-winning poet was in residence twelve times from 1983 – 2010.Inez with her auburn air and bucket hat was a wonderful summer presence at VCCA.See her tribute to a VCCA hornet in her poem below. Inez was the author of eleven books of poetry and a memoir, and her work was published in over one hundred anthologies and textbooks. She collaborated with several VCCA Fellows, among them Pulitzer Prize-winning composer and VCCA Fellow David del Tredici. Inez and del Tredici produced a song cycle titled Miz Inez Sez for a CD that “may be the best new music album of the year” wrote The New Yorker. At the time of her death, she was collaborating with VCCA composer Gina Biver on a piece that is scheduled to premiere in October 2018. Composer Alexander Blank is working on a solo piece for flute. This might seem like enough to fill a residency, but it is not a typical musical score. 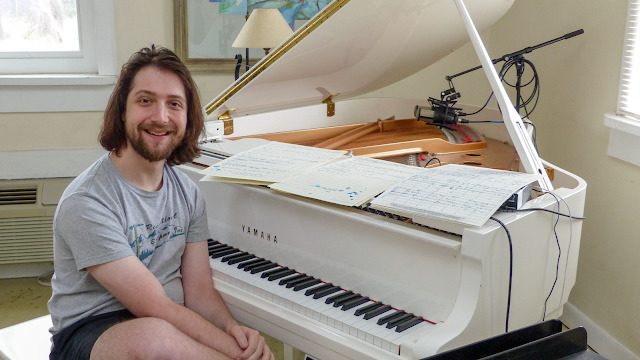 Much of the music that Blank writes is microtonal, or “using pitches that lie in-between the white and black keys of the piano,” and these explorations have opened up his compositions to literally billions of additional possibilities.